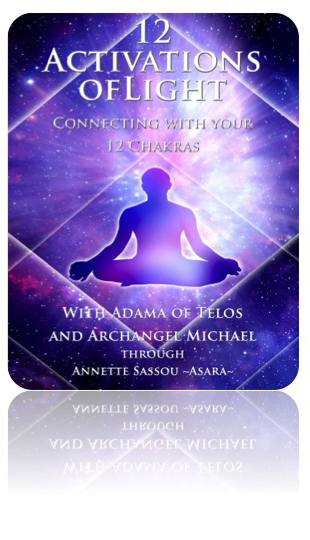 AboutClick for more info: About Telos About Adama About Archangel Michael About Annette Sassou Adama is an ascended master and high priest of Telos. Telos is a 5th dimensional city, which has been established underneath sacred Mount Shasta, CA after the destruction of the two civilizations Atlantis and Lemuria. Adama’s message assists humanity to ascend with their physical bodies into the 5th dimension of love and light and to create Heaven on Earth. One of the tools for the ascendant (those who would like to raise their vibrational frequencies and to integrate their light bodies) is to raise our consciousness and to become more aware of the ongoing process of ascending our physical, mental, emotional and light body, which already has begun. We are most grateful for all the assistance given by the 5th dimensional realm of the Ascended Masters and the Angelic Hosts. to Master Your New Reality? Got Your free Gifts, already? with The 12 Activations of Light!